Five Reasons Why Rainy Days at Walt Disney World Are My Favorite! If you visit Walt Disney World enough, there will come a time when you will encounter inclimate weather -AKA rainy days. There are two things you can do: run for the park exit or persevere. 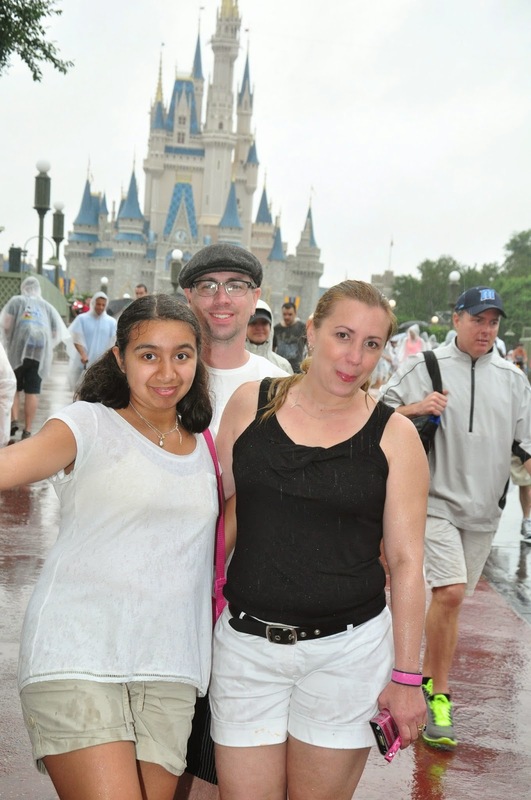 My family and I relish rainy days at Walt Disney World. Why? I’ll give you five great reasons why rainy days at Walt Disney World are our favorite! 1. No Dole Whip Line! You read that correctly. Everyone that’s visited Adventureland in the Magic Kingdom at Walt Disney World has seen the lines that can, and do, go on for days at Aloha Isle. Folks line up for an hour (I know I’ve been guilty of this multiple times!) to snag a Dole Whip Float in their favorite flavors. What’s this got to do with rain, you ask? Check out the image above. That’s me and The Kid pointing to the lack of line at Aloha Isle during a rainy day at Disney. See? It’s not an urban myth, after all. prednisone 10 mg tablet price http://cinziamazzamakeup.com/?x=dove-comprare-viagra-generico-25-mg-pagamento-online-a-Roma Update: Dole Whip cups and floats have moved locations and are now next to the exit of Disney’s Enchanted Tiki Room. Although the lines are more manageable, there’s still a wait for my favorite snack- and rainy days definitely cut back on the lines! Annual Passholders and folks that live close to Walt Disney World aren’t going to head to the parks on rainy days, but for the ones that have driven over 1,000 miles to visit like we do twice a year, we’re hanging at the parks! On rainy days (unless it’s a holiday), you’ll encounter low crowd levels, therefore low wait times for most rides. Walt Disney World has a parade especially for rainy days in the Magic Kingdom that many folks don’t get a chance to see. Although quite short, Disney characters are covered in large, covered vehicles. They wave out of the windows at the small number of Disney guests, and to be honest, we loved it. Besides, when can you walk up to any viewing area 30 seconds before the parade starts in Magic Kingdom and have a front row view? This photo was taken in the rain right after lunch. On a Friday. At Magic Kingdom. Enough said. http://cinziamazzamakeup.com/?x=sildenafil-5-mg-once-a-day-prezzo You know what I’m talking about: You find a Photopass Disney Castmember that is not already taking photos on Main Street U.S.A., stand exactly where he tells you, center yourselves in front of Cinderella Castle, get your photo taken, go home, race to the computer to find the sunny day squinting family. Rain= no squinty eyes. Check out the image above. proscar price 2018 online If you’re from a northern climate like we are, 80 degrees and rainy at Magic Kingdom is like a pool with a giant playground in it! We even twirled down the street in Liberty Square with our arms outstretched. You read that right. I’m not above twirling. http://cinziamazzamakeup.com/?x=levitra-originale-effetto Now you kinda sorta have me hoping for rain when we visit 🙂 Looks like you all had a great time! click here I've only encountered rain at Disney for a very brief time (maybe 20 minutes) out of 3 seven day trips to Disney! We toughed it out and enjoyed the smaller crowds and short wait times, but I didn't know the Dole Whip stand should have been my go-to place! Now I know! 1,138 days!!! Yay for planned trips to Disney! If you need help, let me know!